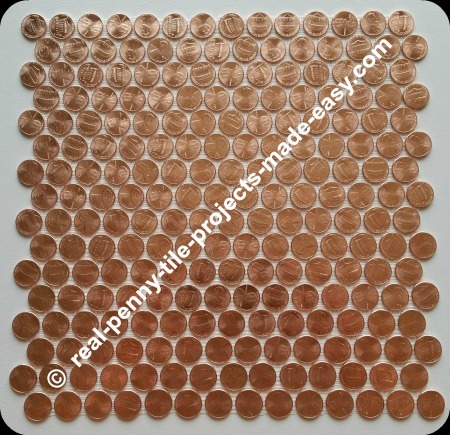 PENNIES - Brand New Shiny Uncirculated Pennies as Mosaic Tile Sheets. The following item is discontinued because brand new pennies are needed to make it, and we noticed tiny spots of rust/oxidation on the new uncirculated pennies even as they are new in the box. Exposure to air and humidity causes this process to begin right in the box. 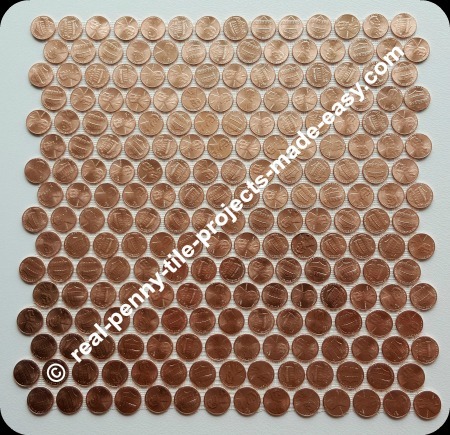 These penny tile sheets are the same size as our standard penny tile sheets (with random pennies) but, all 224 pennies on each of these sheets are brand new shiny uncirculated pennies which make for quite a unique real penny mosaic tile. Here are a few pictures showing different views of a shiny penny sheet to give you an idea about its looks from different angles depending also on where the light is coming from. Looking at it from a different angle, makes the shiny pennies stand out much brighter. 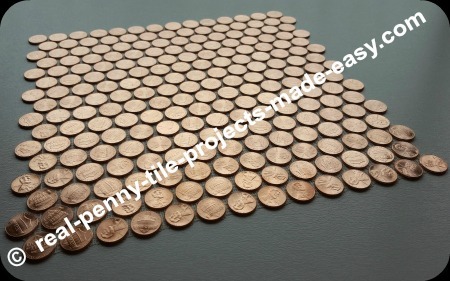 In these pictures we wanted to show the contrast between our standard penny tile sheets next to a shiny pennies sheet. The angle from where these pictures were taken was chosen to bring out the strongest contrast between the two kinds of penny tile sheets. Other angles don't bring out such a strong contrast. It all depends on where the penny tile sheets will be installed, where the light is coming from and where the person viewing is positioned. These shiny penny sheets interlock with our standard sheets as they are the same size. 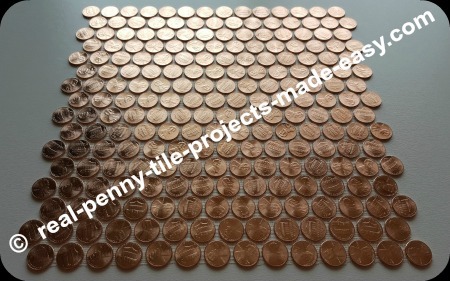 All the details of a standard penny tile sheet apply to the shiny penny sheets except the fact that they are made with new shiny pennies only versus random ones. These shiny sheets are only made to order. The least amount of time these are exposed to air, etc., the best chances to keep their new look. That's why we don't stock these and make them right after receiving your order, provided the shiny pennies are available. To have the best chances in preserving the look of these shiny pennies, the best way for this process to take place is as follows: order placed, manufacturing, shipping, installation, sealing the pennies. The availability of these shiny new pennies may be a factor, so you can either place your order and we'll let you know the current situation or you can check with us to find if there's enough to manufacture your order right away.